In commissioning it, Virginia Festival director Robert Cross asked only for a work on the Civil War. What exactly it would be was up to Gordon and Campbell. "I couldn't see a big three-act opera on the war," Gordon says. "The challenge was to make the subject manageable -- to cut it down." Gordon brought Campbell on board, and they both started reading. "Virginia was so central to the war -- and so divided!" Gordon says. "We decided to focus on just one county in the state: Rappahannock." 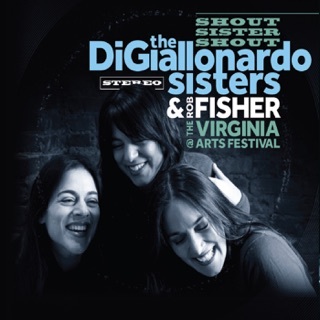 The two decided on music theater as their genre, and Gordon thought in terms of a cycle of songs to be performed by a small group of singers, each of whom plays a number of roles. Although the final score is divided into five acts -- one for each year of the war -- they are performed without interruption. The work lasts 85 minutes. "The poems offer no cohesive narrative, they must be performed without intermission," the composer says. "That would break the mounting intensity of the cycle." Campbell's texts draw on letters, diaries and other documents from a group of people, both black and white, who experienced the impact of war first hand. The goal of the creative team was a work in which individuals speak with intimacy. "But the personal is political," Gordon says, "and the political is personal. "The piece has the sense of a lens closing in on a spectrum of individuals and their feelings around slavery and morality in a profound and poignant way. Mark's libretto shows what everyone has to lose -- or has lost." 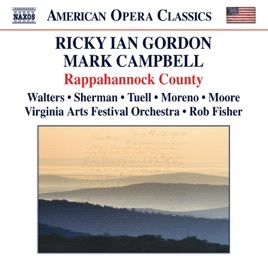 The acclaim accorded Rappahannock County by the 2,200 people who packed Norfolk's Harrison Opera House for the premiere made clear that Gordon and Campbell had achieved their goal. The work, described by Gordon as "a series of snapshots of life and loss during the war," makes no attempt at narrative unity, but focuses rather on intensely emotional moments in the lives of 30 individuals portrayed in Norfolk by five extremely talented young singers. Indeed, soprano Aundi Marie Moore, mezzo Faith Sherman, tenor Matthew Tuell and baritones Kevin Moreno and Mark Walters were an unusually well balanced group of singers who clearly had taken the message of this stellar new work to heart. For the texts Campbell created a language magnificently suited to their contents. It reflects the period and the events described with no attempt at dialect-like coloring. Wisely, the texts were projected as supertitles during the performance. The 17-pieces orchestra -- Rob Fisher conducted Mr. Gordon's and Bruce Couglin's orchestration of the score -- played behind a scrim, on which were projected telling visuals designed by Wendall Harrington. They included actual photographs along with landscapes and documents that contributed much to the easy flow of the score. Gordon had wanted the songs to be performed without interruption; but, growing applause documented the increasing involvement of the audience during the premiere performance.